Catalyst Updates Archives | Catalyst Consulting Group, Inc.
Chicago, IL – Catalyst Consulting Group, Inc (CCG) is proud to announce it was recently featured in Upcity as one of the Top 8 Salesforce Consultants in Chicago. The UpCity team analyzed Salesforce consultants in Chicago to find the most reputable partners for small and medium-sized business owners. As an IT consulting firm, Catalyst has a team of experienced tech professionals that are certified in Salesforce. Catalyst has utilized the Salesforce platform in many projects, such as for the Cook County President’s Office, Service, Inc., and the current 311 modernization project with the City of Chicago Department of Innovation and Technology (DoIT). The 311 modernization project involves moving the city’s 20-year-old 311 system over to Salesforce. Catalyst has over 10 years of combined experience working with Salesforce workforce management and over half the members of the Catalyst Salesforce team hold certifications in Salesforce. As such, Catalyst is honored to be featured in UpCity’s list as a top Salesforce Consultant in Chicago’s thriving tech industry. We will continue to bring our extensive Salesforce qualifications, familiarity, and development experience to our clients to help them navigate the ever-changing waters of the fast-growing technology industry. At Catalyst, building meaningful, valuable connections with our clients and partners is just as important as the technology solutions we create. Taking the time to understand the ins and outs of your business isn’t just something we like to use in our sales pitch. It is embedded within the core values of our firm. It is the first step in our business approach and it is how we’ve sustained long-lasting relationships with our clients for the past 24 years. Each member of our team brings an innovative approach to the solutions we develop, is committed to your business and is easily accessible when needed most. Let us be the CATALYST that sets you on the course to success without compromising what makes you, you. For more information please visit our website at: www.catconsult.com. Chicago, IL – Catalyst Consulting Group, Inc. (Catalyst) is pleased to announce it was recently awarded a contract with the City of Chicago Department of Innovation and Technology (DoIT) to implement a new Customer Relationship Management (CRM) solution to replace the current Chicago 311 system. The new 311 system, built on the Salesforce platform, will increase city transparency, improve the city-resident relationship, and foster communication and collaboration between city departments. In 1999, the city implemented its current 311 system. Built as a “one-stop-shop” for resident-access to all city and non-emergency services, the system eliminated the need for a number of smaller, departmental call centers. The centralized Chicago 311 system freed up city departments and allowed them to focus on resident requests and department-specific work. Nearly 20 years later, the system is ready for an update. 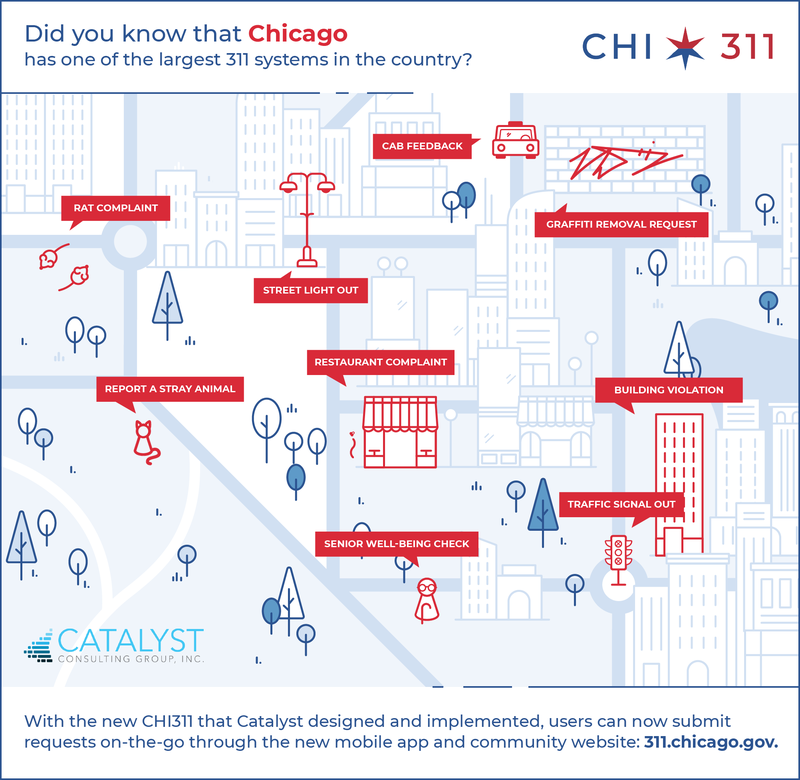 Catalyst has been selected to develop and implement the new Salesforce-based Chicago 311 system. Developing the system on Salesforce, the world’s top Customer Relationship Management (CRM) platform, provides the city with access to the most modern and advanced toolbox in the industry. With the new cloud-based system, city departments can improve their internal workflows by automating manual processes and integrating with the external systems on which they depend. Operating on the current Chicago 311 system, departments lack the ability to communicate and collaborate easily on issue resolution. Today, if a service request submitted by a resident requires work from more than one city department, the work is handled separately and the transfer of work is not visible to the resident. As a result, resident updates are segmented, inconclusive or non-existent. 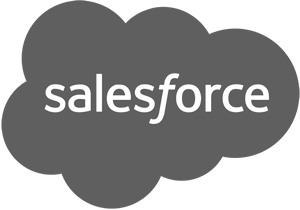 On the new system, Salesforce’s robust work order management facilitates inter-departmental service request transfers and communication, decreasing the total time it takes to complete a request and provides a holistic view of the work required to satisfy any request. Most importantly, the new Chicago 311 system will provide the city with the tools it needs to improve communication with its residents. With increased collaboration between city departments, residents will be able to track their service request from start to finish and access personalized user profiles to check the status of their request at any time. 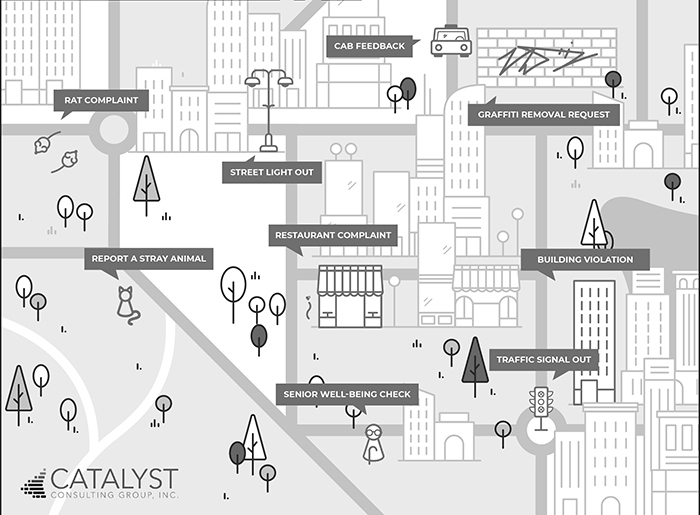 To accompany the internal Salesforce solution, Catalyst is developing a public-facing website and mobile application for residents where they can opt-in to receive real-time updates and push notifications on their request. Through these improved communication channels, residents can better communicate their needs to the city and the city is well-equipped to listen. Catalyst has worked with the City of Chicago on various engagements for over a decade and is excited to continue to grow and strengthen its relationship with the city. Chicago, IL – Catalyst Consulting Group, Inc. (Catalyst) is happy to announce it was recently featured in Toggle Magazine for the development work it completed with the Department of Finance (DoF) on the Online Full Payment Certificate application. For the past six years, Catalyst has worked closely with DoF to redevelop and support the Online Full Payment Certificate (OFPC) application. Back in 2012, DoF and the Department of Innovation and Technology (DoIT) decided the city’s FPC application needed a reboot. Catalyst was contracted to assess the legacy application and work with DoF to modernize it so that users could complete the FPC application online from end-to-end. In June of 2015, the new application was launched. Once launched, the OFPC application increased the amount of applications completed online from 15% to 87%. Most importantly, the average number of days to process an application reduced from 10 days to one. Catalyst continues to support DoF with the OFPC application as well as other initiatives within Utility Billing and Customer Service. Catalyst would like to extend a big thank you to Toggle Magazine for capturing this initiative and sharing it with its many readers. Toggle is a quarterly business-to-business trade journal highlighting the vital role that technology plays in a variety of companies and organizations — making a strong case for the centrality of technology professionals in the day-to-day operations of their institutions. Our journal compiles a collection of stories from the perspectives of technology executives of health care facilities, financial institutions, schools and universities, and other organizations across the country. Whether these operations source technological expertise in-house or from outside their organizations, we explore how institutions tackle the execution of state-of-the-art systems and platforms, the development of cutting-edge hardware and the integration of these technologies into day-to-day operations. The City of Chicago Department of Finance provides effective and efficient management of the City’s financial resources. It is responsible for the collection or disbursement of City revenues and all funds required to be in the custody of the city treasurer. At Catalyst, building meaningful, valuable connections with our clients and partners is just as important as the technology solutions we create. Taking the time to understand the ins and outs of your business isn’t just something we like to use in our sales pitch. It is embedded within the core values of our firm. It is the first step in our business approach, and it is how we’ve sustained long-lasting relationships with our clients for the past 25 years. 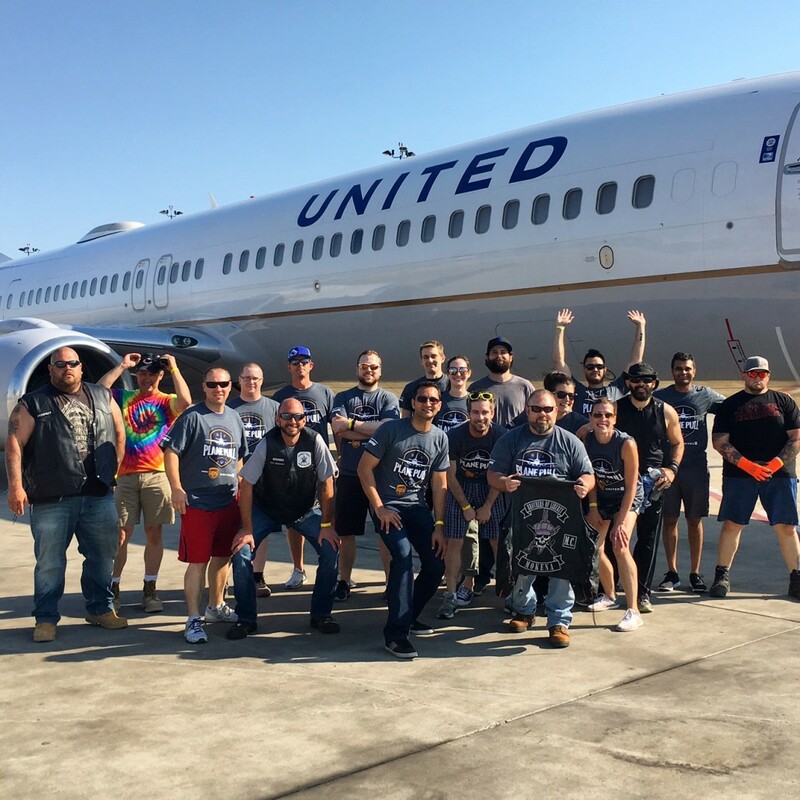 Chicago, IL – This past weekend, the Catalyst team took on a United Airlines 737 at the Law Enforcement Torch Run 2017 Plane Pull. 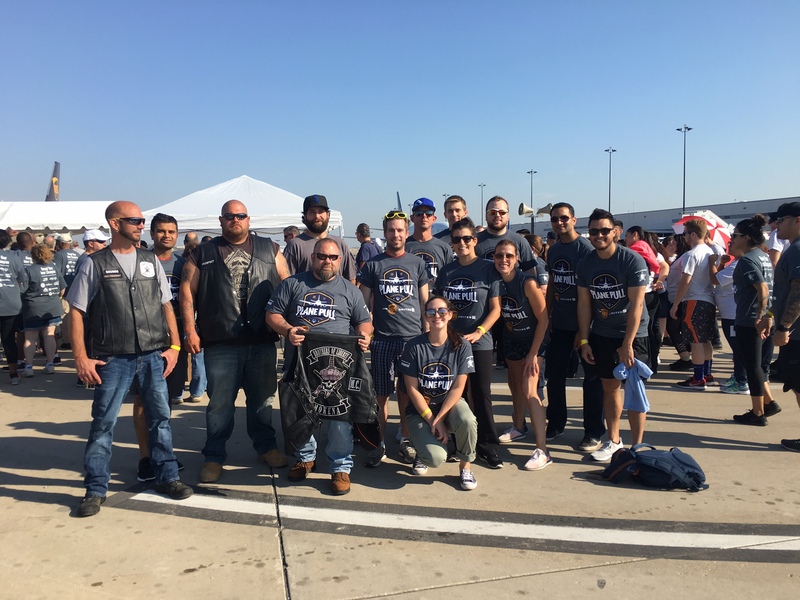 The event took place at O’Hare International Airport at the United Airlines Cargo Facility and supported the Special Olympics Illinois. The CAT-a-Pullers took on more than 80 other teams in the tug-of-war competition that involved a battle with a 90-ton aircraft. This is the ninth year the Special Olympics and the Law Enforcement Torch Run have sponsored the event. Each team raised over $1,000 to benefit the more than 22,000 traditional athletes and more than 20,000 Young Athletes (ages 2-7) currently participating with the Special Olympics Illinois. 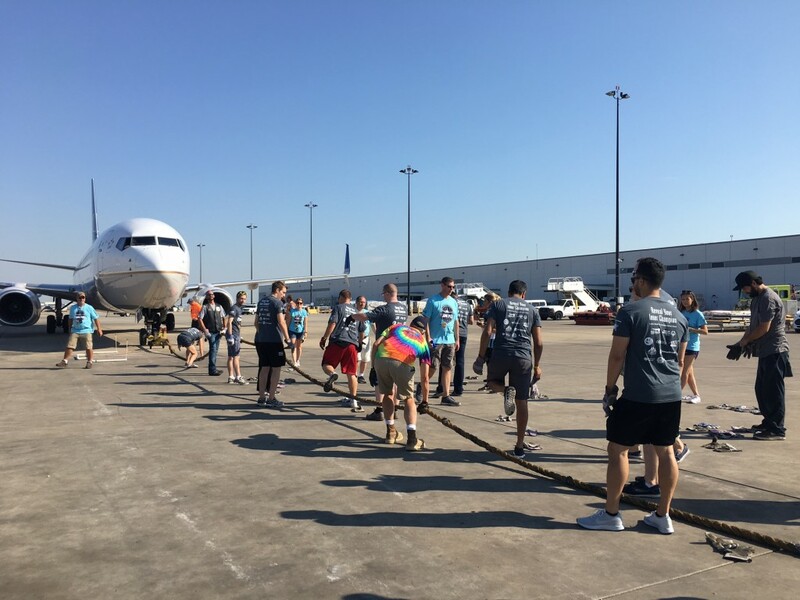 Though our team was not victorious, it took just nine seconds to pull the UA737 12 feet to the finish line. We had so much fun participating in the event and are proud to support the athletes of the Special Olympics Illinois. Thank you to all the participants who joined our team. 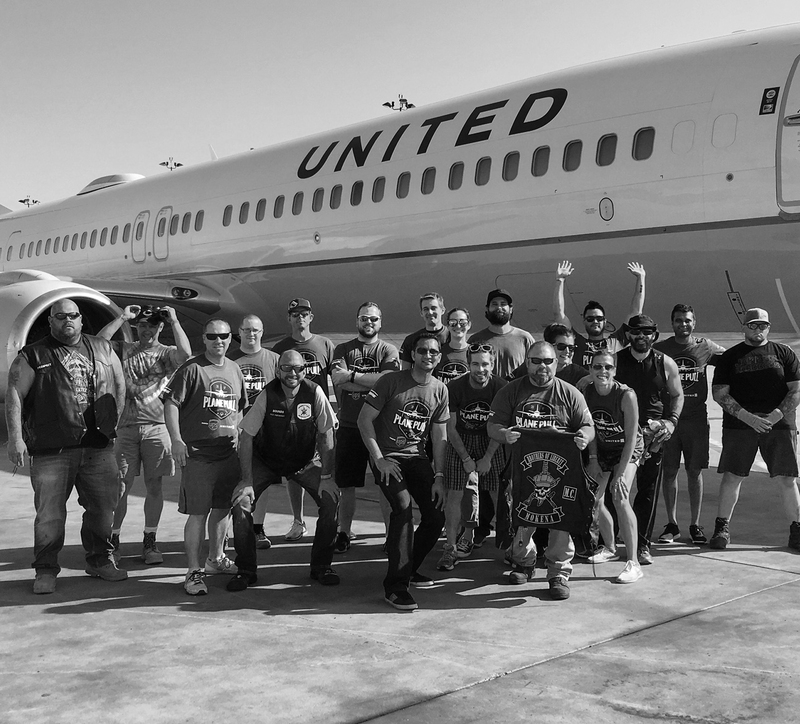 We couldn’t have pulled the aircraft without you! Catalyst Partners with MapR Technologies, Inc.
Chicago, IL – Catalyst Consulting Group, Inc. (Catalyst) recently partnered with MapR Technologies, Inc. (MapR), the only provider of the Converged Data Platform. The MapR platform converges essential data management and application processing technologies on a single, horizontally scalable platform. As system integrators for many public-sector entities, we are excited to leverage MapR’s technology to provide a unique, public-sector focused system integrator practice to the Chicagoland and Midwest area. With MapR, businesses can directly process files, tables, and event streams. Unlike “connected” environments that require complex integrations, convergence offers a streamlined architecture that enables real-time insights, a consistent security framework across compute engines, higher resource utilization, and reduced administrative overhead. The recent partnership between Catalyst and MapR is forward-thinking as local public-sector organizations look to consolidate their technology and information stacks while also attempting to generate new revenue opportunities through the various data sets within those landscapes. The MapR big-data platform will provide the strategic value proposition to these companies while Catalyst provides a seamless system integration service. In addition to providing a key service to public-sector companies, through this partnership Catalyst and MapR will become a key system integration resource in the Midwest area for private-sector companies looking to leverage big data in their technical landscapes. We are excited to build upon this new partnership and provide integration services to companies and organizations throughout the Chicagoland area. Chicago, IL – It’s no secret that the tech industry has impacted and influenced our lives greatly. With each passing year we become increasingly more digital, and there are no signs of that stopping anytime soon. As an IT consulting firm that leverages technology to help businesses drive their companies forward, this is all great news to us. The tech industry is our bread and butter- and our jam, too, while we’re at it. So when we saw CompTIA’s 2017 Cyberstates, a report of the state of the tech industry, we had our design team whip up a nifty infographic to share all of the fun facts. We also took some time to hone in on statistics specific to Chicago for two reasons: one, it’s our home city and just so happens to be one of the best cities in the world, and two, Chicago was recently ranked as the #1 emerging tech hub. So with that in mind, enjoy our infographic, and be sure to check us out for all your IT and business management consulting needs. 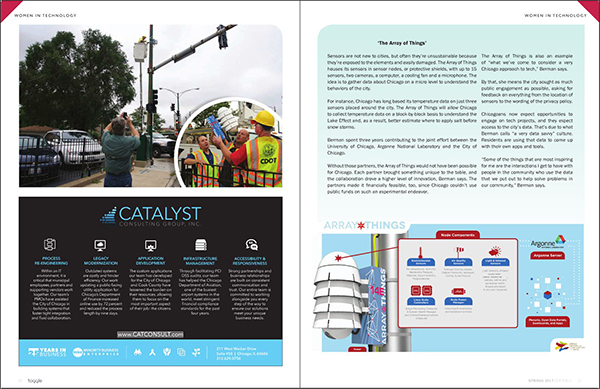 Chicago, IL – Catalyst Consulting Group, Inc. (Catalyst) is happy to announce it was recently featured in Toggle Magazine next to an article highlighting Chicago’s smart city initiative, the Array of Things. As cities across the globe begin to leverage big data to better serve their constituents, the idea of the “smart city” is quickly spreading throughout the tech industry. 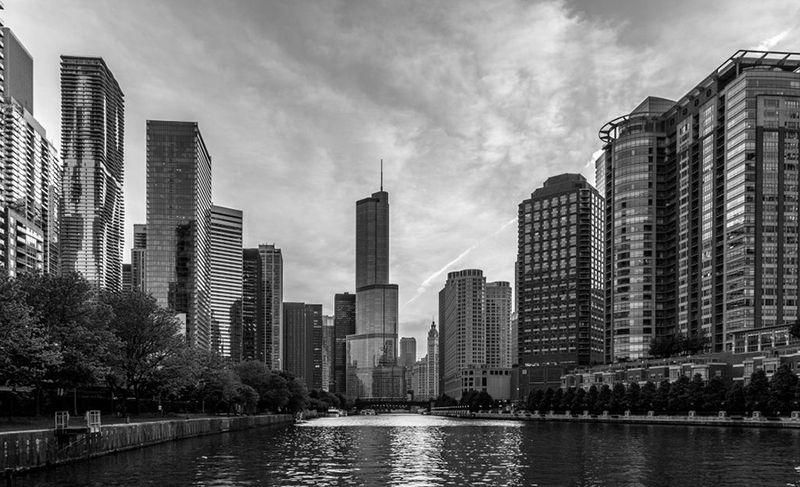 As a tech consulting firm doing business in Chicago, we are proud to see that our city is already in the mix when it comes to smart city initiatives. The Array of Things officially launched in the summer of 2016 and has already installed 42 nodes across the city collecting information on climate, weather, air quality, and vehicle and pedestrian flow. The data collected will allow the City to plan on a level unseen in history. For instance, collecting temperature data on a block-by-block basis will offer a firm understanding of the Lake Effect which, as a result, gives the City better estimates on where to apply salt before snow storms. Insight like this will greatly improve the City’s services and, in turn, improve the lives of its residents. Accompanying the article is a Catalyst feature highlighting our company’s consulting services and recent rebranding. In the summer of 2016, Catalyst launched a new website with updated content and modernized branding offering greater insight into who we are as a company. We are proud to be featured side-by-side with Chicago’s Array of Things, and as residents of the City we are dually excited to see this smart city initiative grow. The Array of Things (AoT) is an urban sensing project, a network of interactive, modular sensor boxes installed around Chicago to collect real-time data on the city’s environment, infrastructure, and activity for research and public use. AoT will essentially serve as a “fitness tracker” for the city, measuring factors that impact livability in Chicago such as climate, air quality and noise. AoT is an urban-scale “instrument” that will enable the City, urban planners, residents, and researchers to monitor and examine Chicago’s environment, infrastructure and activity, including detecting trends and changes over time. Ultimately, the goal is to measure the city in sufficient detail to provide data to help engineers, scientists, policymakers and residents work together to make Chicago and other cities healthier, more livable and more efficient. 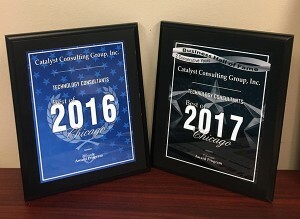 Chicago, IL – Catalyst Consulting Group, Inc. (Catalyst) is proud to announce we have been selected for the 2017 Best of Chicago Award in the Technology Consultants category by the Chicago Award Program. Each year, the Chicago Award Program identifies companies that they believe have achieved exceptional marketing success in their local community and business category. These are local companies that enhance the positive image of small business through service to their customers and the community. As a small business that has been in the industry for the past 25 years, we are honored to receive the award. 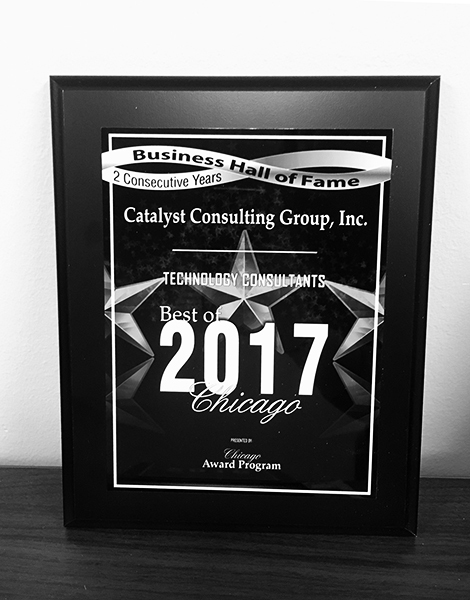 Additionally, Catalyst is among a very small group of companies that have won the Best of Chicago Award for two consecutive years. This distinction has entered us into the 2017 Chicago Business Hall of Fame. We are proud to accept the award and will continue to bring technology solutions to our many clients throughout the industry. Chicago, IL – Catalyst Consulting Group, Inc. (Catalyst) recently assisted the Chicago Department of Aviation (CDA) with the redevelopment and redesign of their public-facing website Flychicago.com. The new website features a fully responsive design, expanded functionality, and improved wayfinding via Blue Dot technology powered by Google Maps. For the past six years, Catalyst has supported the CDA with their application development initiatives, including the support and maintenance of Flychicago.com. 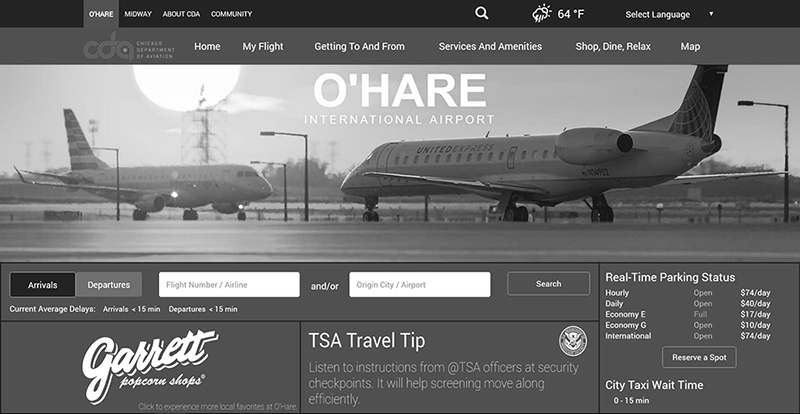 On average, the public-facing website receives about 10,000 visitors a day and is the main source of passenger information for O’Hare and Midway International Airports. Prior to redevelopment, Flychicago housed two separate sites: one for desktop and another for mobile devices. Maintaining content across two sites was oftentimes difficult and cumbersome. To modernize the website and remain in line with industry standards, Catalyst developed the new site using responsive design. A responsive design allowed Flychicago to be viewed in response to the size of a screen, allowing it to be accessed via desktop, tablet, or mobile and eliminating the need for two separate sites. The new design also features clean lines, updated photography, integration with the CDA’s new logo, and incorporates UI/UX best practices. Most importantly, Catalyst developers expanded and improved Flychicago’s in-terminal maps, making them fully accessible to mobile users. Prior to redevelopment, maps were only accessible via desktop, providing no value to passengers within the terminals. By integrating the maps with Google and adding Blue Dot technology, passenger wayfinding vastly improved. Furthermore, the new maps allow for direct promotion by CDA’s concessions with the potential to increase sales revenue. Other new site features include improved passenger flight search functionality, increased website accessibility, and consolidated content for an improved user experience. Catalyst will continue to support Flychicago and work toward consistently improving its functionality for an improved end user experience. At Catalyst, building meaningful, valuable connections with our clients and partners is just as important as the technology solutions we create. Taking the time to understand the ins and outs of your business isn’t just something we like to use in our sales pitch. It is embedded within the core values of our firm. It is the first step in our business approach and it is how we’ve sustained long-lasting relationships with our clients for the past 25 years.